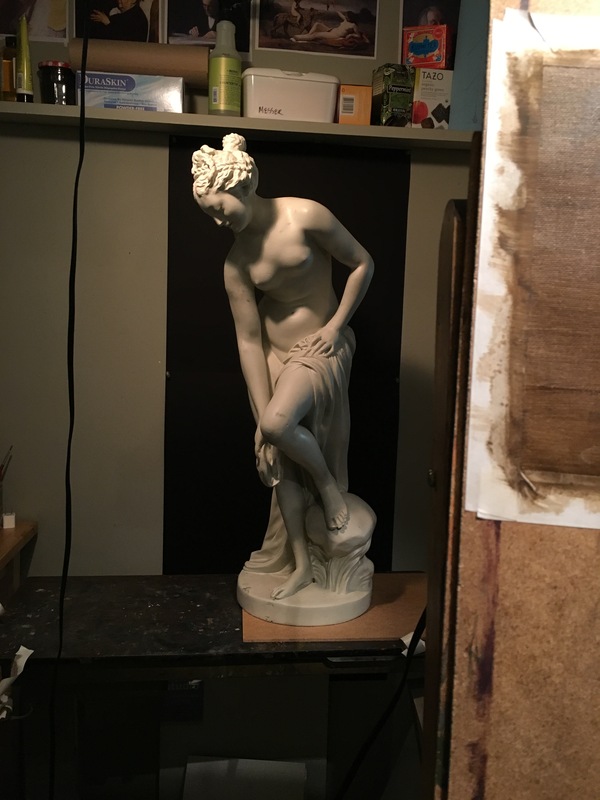 Here are some pictures of my projects from my first month back in the atelier. We started the year with poster studies. These are small studies made using patches of value that help us to plan for larger paintings. 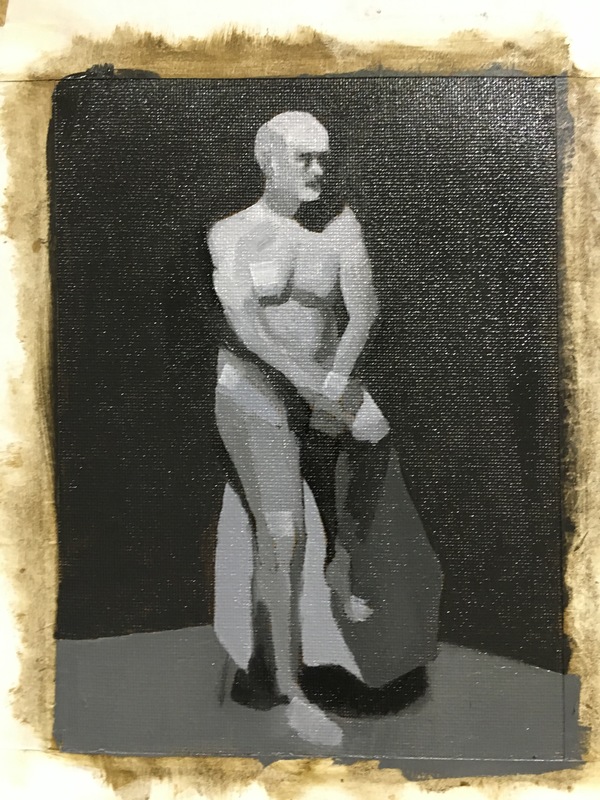 Painters can solve major compositional and value problems with these studies and they are especially handy during modeling so we don’t lose track of the bigger picture. In the afternoon studio sessions we started learning how to make poster studies by copying master works. My first poster studies were copies of paintings by William Nicholson and Andrew Wyeth. 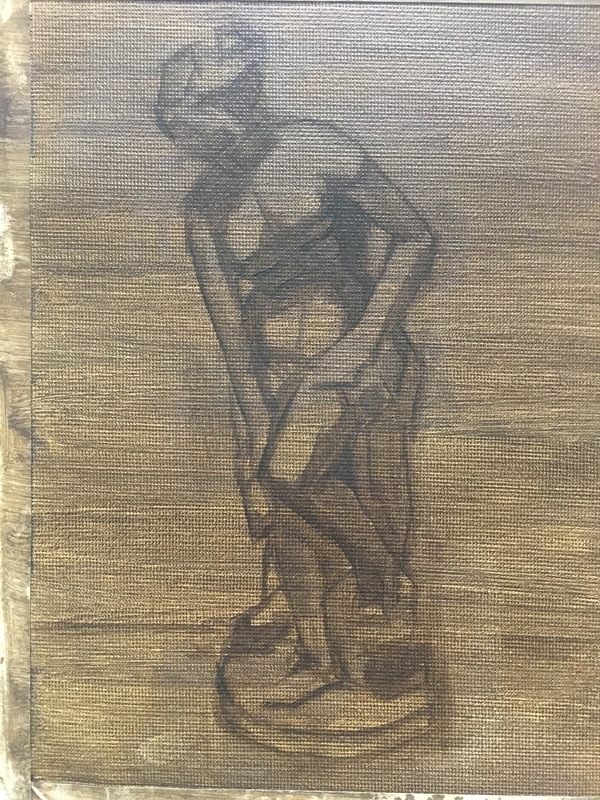 This poster study is a copy from “Portrait of Maude Cook” by Thomas Eakins. The original is gorgeous. Then we moved onto poster studies of casts and still life. 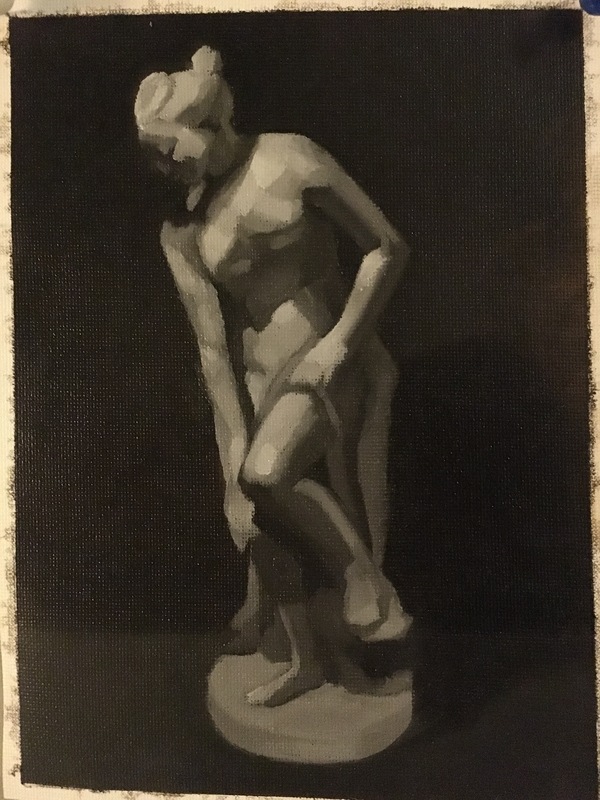 Here you can see I’m drawing from a classical sculpture with a paintbrush on a toned canvas. Then I cover it up with patches of value (light and dark). 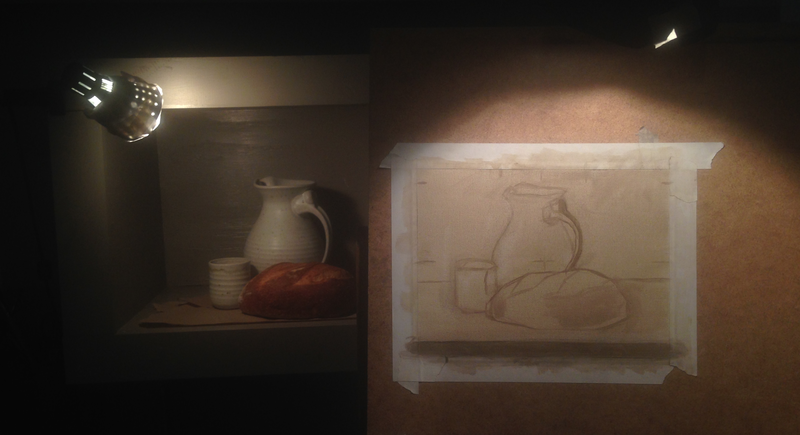 In the studio, I made a set up a of a jug, a cup and a loaf of bread. 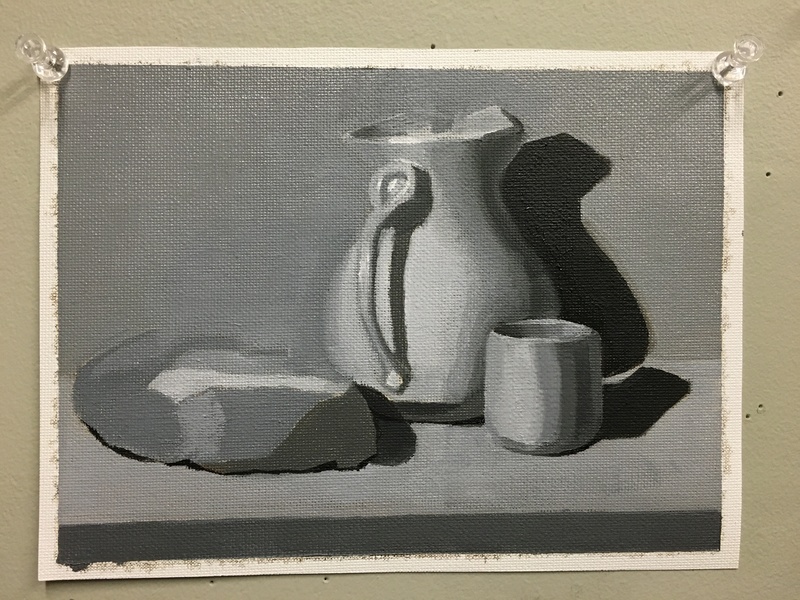 I was trying to emulate the feeling of William Nicholson’s still lifes (I copied one of these in a study early on). First you can see me playing around with my composition here in a lightbox. Once I found a good set up, I made a poster study. 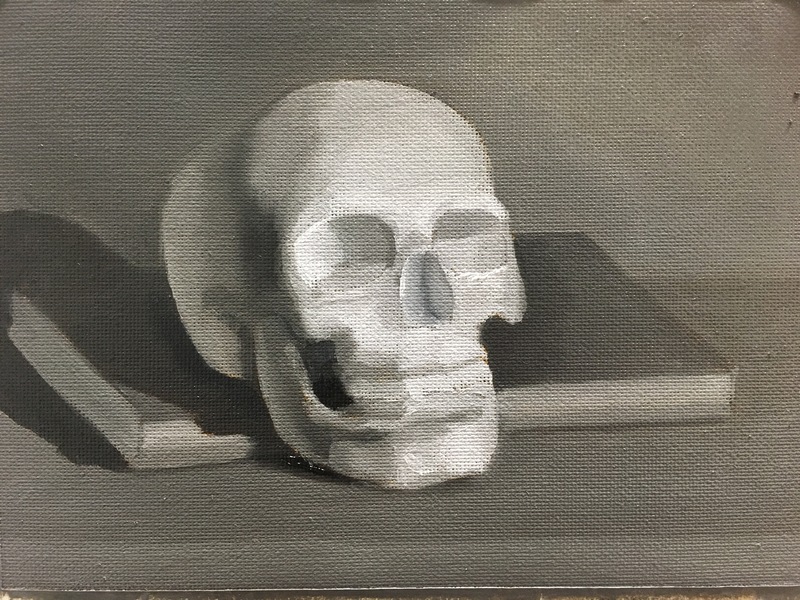 I’m thinking of turning this still life set up of a skull and book into a fully rendered grisaille painting. Here is the poster study. Drawing skulls is necessary for painting better portraits. 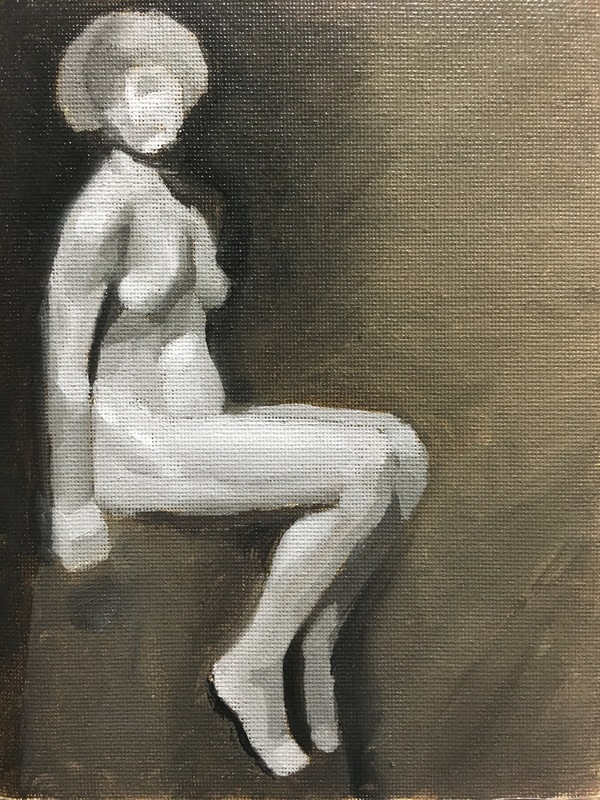 Even though I paint from a live model every day, I don’t get a ton of focused portrait practice because I work on the whole figure. Portraiture is definitely a skill I want to work on. 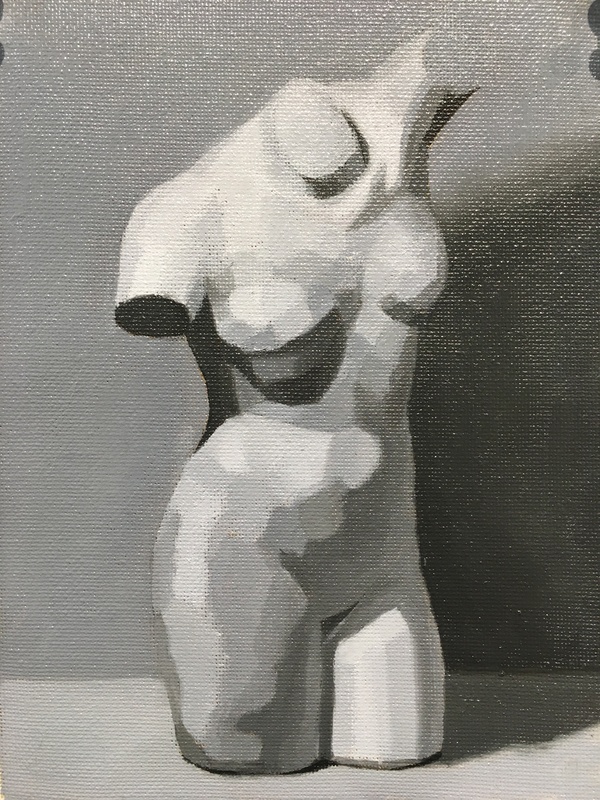 No matter how great the figure work is, I notice paintings often fall apart at the face. I made this during a break while reminiscing about when Yui used to be fat and didn’t have a neck and could be easily represented by one small circle and one large circle. You should see him now, y’all! And from this week. 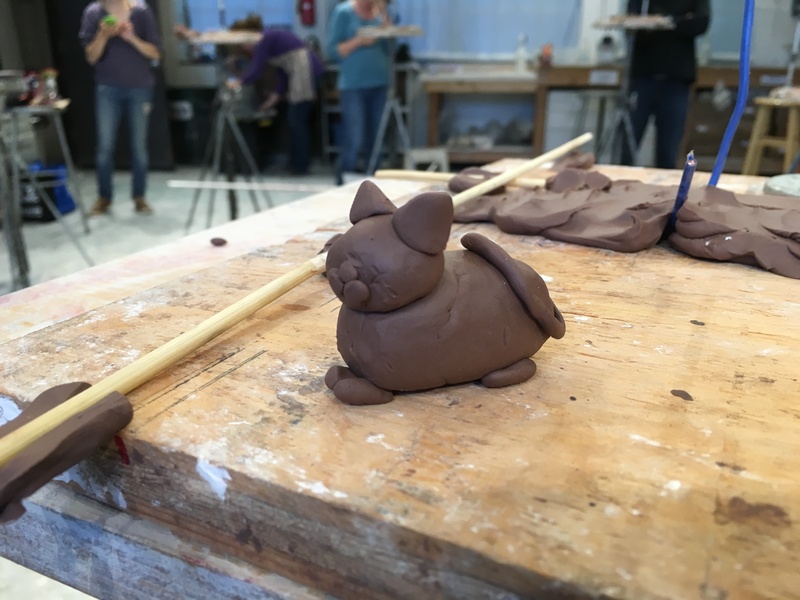 Sculpture is hard. 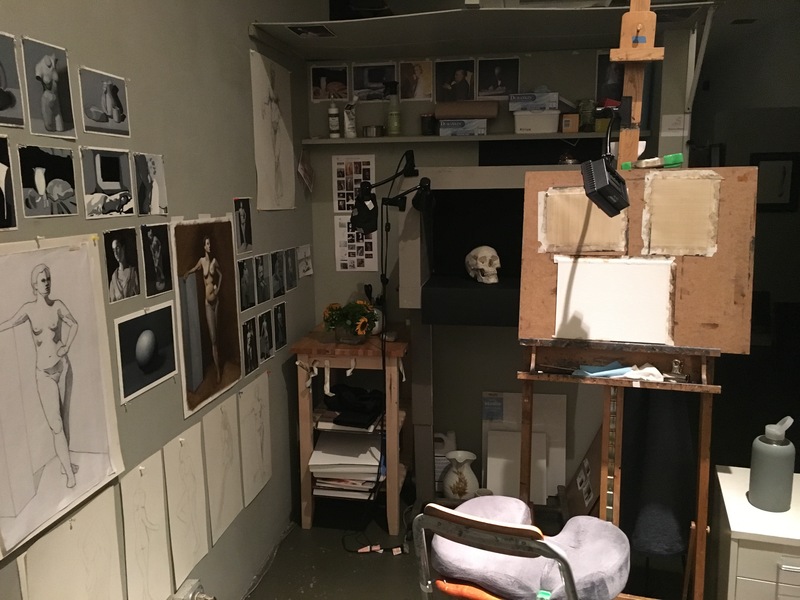 It might be made harder because it’s at night and I’m always exhausted, but the principles of considering a form in 360 degrees are different from those that help you create a 3D illusion on a 2D surface as in drawing and painting. 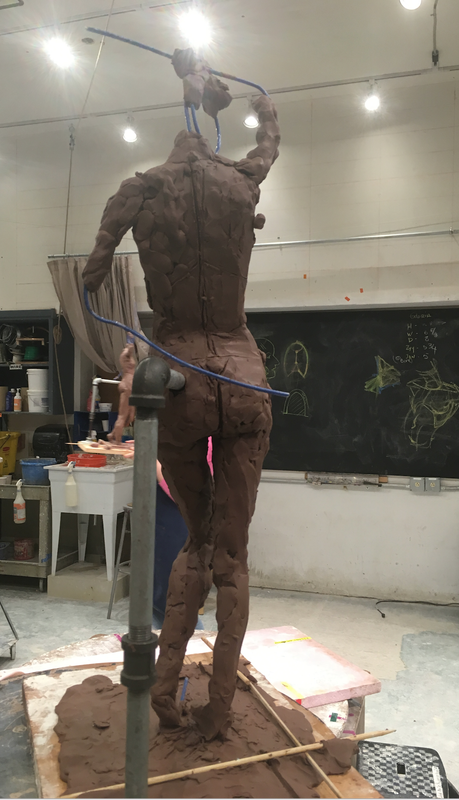 We are encouraged to take a sculpture class because of course it helps us think about anatomy in a different way but it also helps us to think more structurally when we draw. 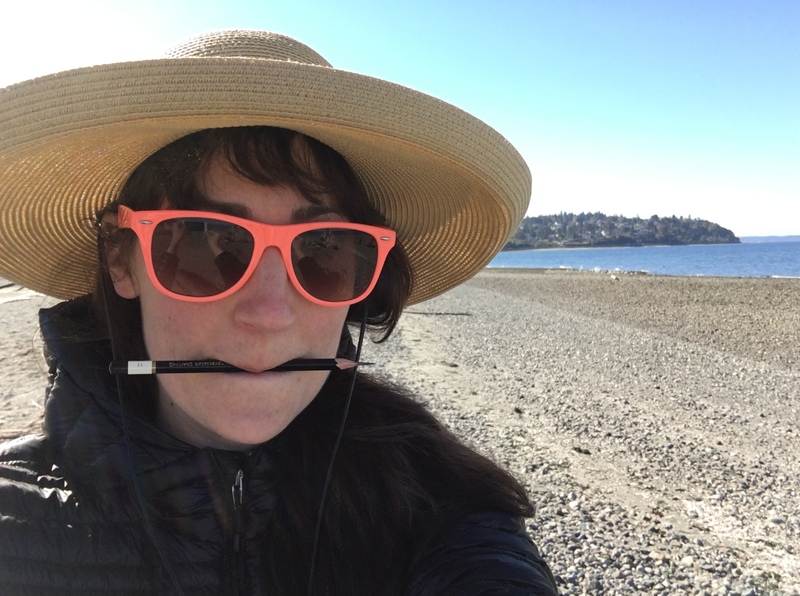 Here’s one of me sketching when we went to Carkeek Park for a plein air drawing day. And here’s my studio space already adorned with projects. Welcome to Year Two. Yayyyy!!!! I was wondering how year two was going. These last two posts make me light up.